The Deep Carbon Observatory invites all members of the DCO community to submit nominations for the 2016 DCO Emerging Leader Awards. 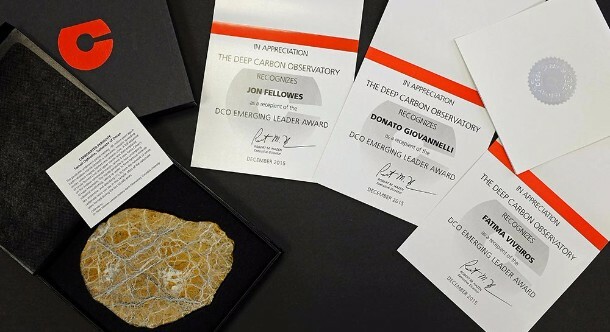 These awards, bestowed annually, honor DCO early career scientists for distinguished performance and unique potential as leaders of the deep carbon science community. Find out more about the nomination process here. The Deep Carbon Observatory had a banner year in 2016 as summarized in the Deep Carbon Observatory 2016: Year in Review. Prepared by the DCO Secretariat, this slide presentation highlights DCO’s crosscutting activities and Science Community accomplishments. It also features early career scientists, who embody the future of deep carbon science. DCO seeks your input as it plans for the future. DCO launched Task Force 2020, chaired by Claude Jaupart (IPGP, France), to sustain and build upon the momentum and impact of DCO. To hear from the community directly, TF2020 is distributing a questionnaire to all members of the DCO Science Network. Please take the time to provide your input and help ensure the future of international, collaborative research in deep carbon science. This year, DCO will be well represented at the Goldschmidt Conference in Paris, France from 13-18 August 2017, with more than 20 sessions of special interest to DCO. Please consider submitting an abstract to one of these sessions, such as “Deep Carbon” and “Reactions in Earth’s Carbon Cycle from the Surface to the Center.” The abstract deadline is 1 April 2017. We invite all members of the DCO community to submit nominations for the DCO Emerging Leader Awards. Congratulations to DCO colleagues who will be honored at Goldschmidt 2017. Eiji Ohtani (Tohoku University, Japan) will receive the Harold Urey Award, recognizing outstanding contributions advancing geochemistry over a career. Shuhei Ono (MIT, USA) will deliver the Paul W. Gast Lecture, which honors a mid-career scientist for outstanding contributions to geochemistry. Bernard Marty (CRPG Nancy, France) has begun his term as president of the European Association of Geochemistry, which co-organizes the Goldschmidt Conference. We are optimistic that the successes of 2016 will continue through the new year and beyond. Funding for a PhD student is available starting Summer/Fall 2017 to work on an NSF-funded project in Isotope Biogeochemistry lab at the University of South Carolina. The goals of the project are to explore how microbes survive and thrive in a warm, high pH serpentinization system, to investigate the fate of deep sea organic matter as it passes through the rocky subsurface, and to determine whether small organic molecules are formed abiotically. This research has implications for the earliest development of life on Earth and other planets, and on Earth’s carbon cycle. Field work includes a 22-day oceanographic expedition with the remotely operated vehicle Jason to the Lost City Hydrothermal Field. For additional information, please visit our website. Interested students can send a letter of interest, CV, and unofficial transcripts to Dr. Susan Lang and/or submit applications through the School of the Earth, Ocean and Environment. Preference will be given to submission prior to 27 January 2017 but the position will remain open until filled. The lab is equipped with two noble gases mass spectrometers: a MAP215 and a VG5440 modified multi-collector spectrometer (both have undergone electronics upgrades), and associated extraction systems and preparation lines. Other instrumentation at Scripps/UC San Diego, including IRMS, is available. Our primary research activities involve targeting isotopes of He-Ne-Ar-CO2-N2 in basalts, xenoliths, geothermal fluids, groundwaters, etc. from a variety of tectonic environments with research directed at mantle plumes, subduction zones, earthquake precursory activity, volatile fluxes, and more. The position is primarily laboratory-based but opportunities will exist for related field studies. The position is available from 1 February 2017. The Department of Earth and Environmental Science and the Center for Energy Research at the University of Pennsylvania seek graduate students interested in any of the following research areas: geomicrobiology, ecology, microbe-microbe and microbe-mineral interactions, biogeochemistry, ecophysiology and bioenergetics. The successful applicants will be awarded a PhD Fellowship package that includes: tuition, fees, health care, and stipend for living expenses. These packages are available starting Fall 2017. 21 December 2016: A supervolcano caused the largest eruption in European history. Now it’s stirring again.